Thanks your letter with list of membership for whom you wish autographed pictures. In my last letter to you, I asked you to let me know regarding your advertising in a paper & other details concerning your operation at the club. I received a post card from you in which you said you would write me in a couple of days & explain matters, but in this letter you did'nt mention anything about it. I also sent you a card, asking you to let me know why you wanted me to send a picture to a Ronald A. Musial of Philadelphia, to whom I had already sent one. I would like to know about that too Gary. As soon as I hear from you again I will forward the pictures you've now requested. With pleasure I shall ship you the print of "This Is Your Life" show - wish I had thought to loan it to you when you were out here, however, will forward it within the next couple of days and will advise you definitely. Frankly, there is very little to it, and a bit disappointing in the fact that there wasn't enough time to devote on two lives at one time, so nothing of interest was brought out, and what was divulged didn't mean a thing to anybody. Anyway, Ralph Edwards and Hazel Bishop got a free show out of it. Sorry to say there's no improvement in Babe's condition, poor fellow, it looks very discouraging. Everything is being done but nothing seems to help him, very distressing. By the way Buck, I'm interested in getting a Chrysler New Yorker but the prices they ask our here are way beyond the cost quoted in Consumer Reports magazine. I would certainly appreciate your helping me in this matter if possible by giving me correct amount of price on this. I understand the car comes equipped with Torqueflight transmission and power steering, other than that I only want electric power seat. I don't need the electric controlled windows, power brakes or radio. I too want heat of course. I wouldn't mind having a '56 model with low mileage if in good condition, whichever one it would be a cash deal. Maybe you could handle this for me and I could pay for the freight on it. Regarding the color, Mrs Laurel prefers cream or white with a trim of blue, red or black if a new '57. These people out here all seem to have the idea that I am getting an income from our TV films, and of course ask inflated prices as soon as they see me coming, hence my asking you to give me the lowdown. Mrs L. joins in kind regards and best wishes. We too shall look forward to the pleasure of seeing you again on your next visit. Sorry to hear your Easter holiday was upset due to a Cold - well, thats what you get for drinking out of a damp glass. (my apologies to Joe Miller). The reason I'm kidding is, that I note you are feeling much better again - otherwise I would'nt be so brash. Anyway its all in fun now that your troubles are over - that includes the relapse too.! Interesting to know that Bob was a singer, did he study voice or is it natural?. Mrs Laurel was a singer, she trained in China for opera, she had a very fine voice, but being a stranger here & unknown also unable to speak the language, it was difficult to get an opportunity to work in opera, her only chance was to work in Russian night clubs in New York, Chicago & Hollywood, then when she married me, she decided to give it up & quit the business. I still think she was very foolish, am sure if she had continued she would have made a great career for herself. Hope you had a nice time at the Post Office banquet last Sunday, that was a good opportunity to wear your new Easter outfit - were the mailmen retiring or had Summerfield fired them?. Sorry to say Hr Hardy is still the same - eight months now, poor fellow, really pitiful. Well, all for now. Mrs L. joins in regards & best to you both. Please pardon my error in sending that letter to you instead of the person intended, it was certainly a mistake on my part & I trust you will forgive my causing you so much trouble over it. It happened that your letter was alongside the one of the party I had in mind to answer first, & for some reason I got mixed up & addressed it to you - I am embarrassed ! Anyway, I hope you will fully understand & accept my deep apology. Enclosed are the autographed pictures I promised you - if you wish any more please let me know. Glad to know you are having success with your club - congratulations. I deeply appreciate your kindness & trouble in giving me full details re the Chrysler "New Yorker". There is certainly a big difference In the cost out here, they ask around 5200 plus Tax & license. 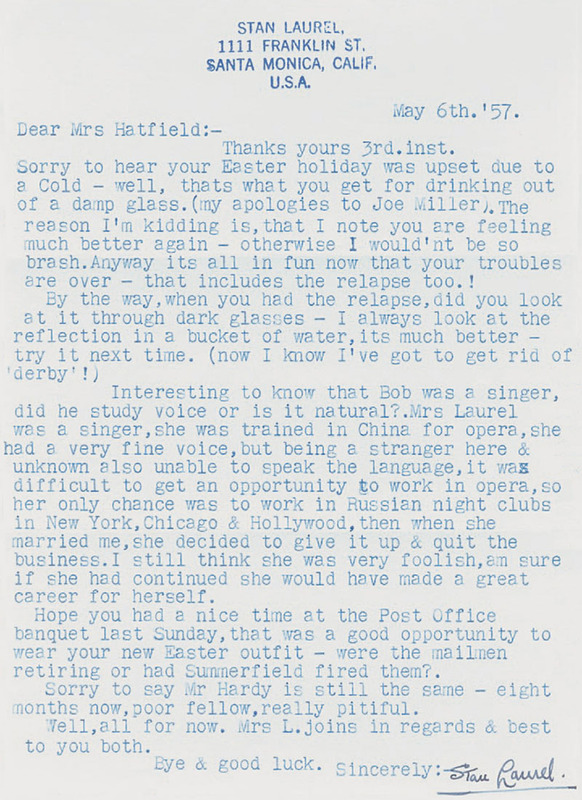 However, Mrs Laurel feels that I should'nt spend so much money. Due to my limited circumstances, she suggests I should get a cheaper car, such as a De Soto "Firesweep" (TorqueFlite), She drove one & liked it very much, it was equipped the same as the "New Yorker" you mentioned but they asked 3800. I would be interested to know what price you could get me one for, if it not too much trouble Buck I would be very grateful. I have a '51.Mercury in very good condition (19000,miles) after I bought it I made two trips to England, which was 16 months I did'nt use it, then in '54. I had the stroke so has had very little use since - hence the low mileage. The reason I wanted a new car is on account of Mrs L. has to do all the driving now, & the steering is very hard on this Mercury & bothers her heart quite a bit, so she is anxious to get power steering - otherwise I would'nt consider buying a new one. Anyway, there is no immediate hurry to give me further information, whenever its convenient for you will be fine. Many thanks for your kind suggestion to drive a car out here for me, it was certainly gracious of you, but I would'nt think of such a thing unless you were intending to come out anyway on business. All for now Buck as we are preparing to rent the house to move into an apartment - its too big for just two of us (the house) & a lot of unnecessary work, so we are in the throes of selling furniture etc. to save storing it all as the apt. will be already furnished. Again many thanks for your kindly interest. Hope the film arrived safely - no hurry to return! We expect to be moving to the Shangrila Apts. 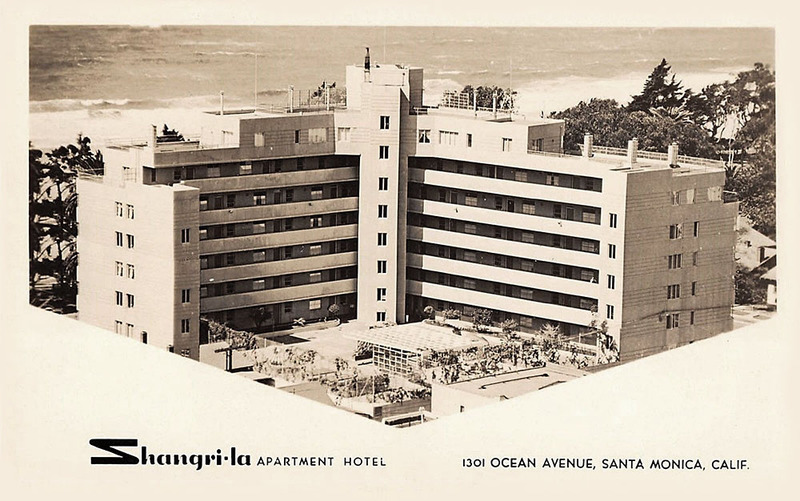 in Santa Monica, facing the Ocean, they have very nice suites there. 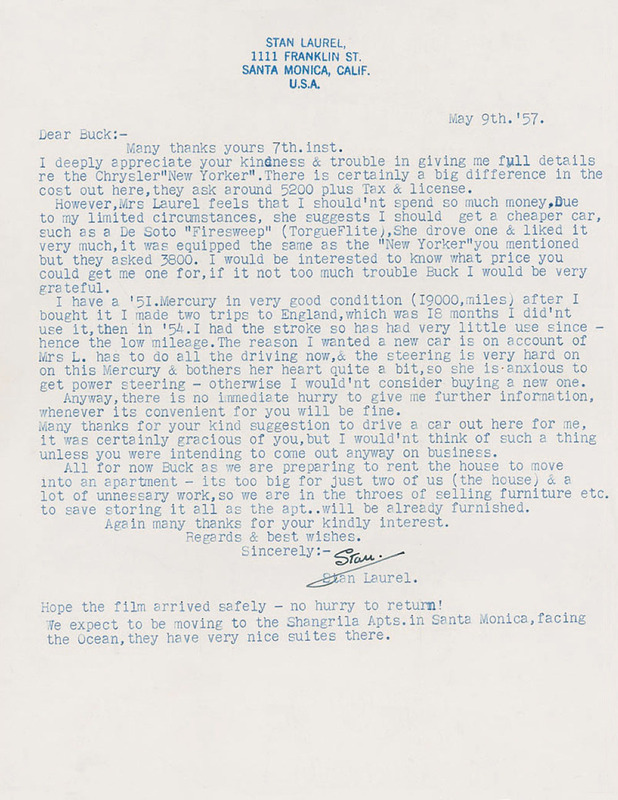 THIS INDENTURE, made the 11th day of May, 1957 between Ida and Stan Laurel - Lessor (whether one or more); and Mrs. & Mr. Lewis Kenneth Rutledge - Lessee (whether one or more); and Joe Braverman, Realtor as agent. WITNESSETH: That for and in consideration of the payment and performance of the covenants contained herein, on the part of the said Lessee, and in the manner hereafter specified, said Lessor does hereby lease, demise, and let, unto the said Lessee, that certain dwelling house and supportenances situated at 1111 Franklin St., Santa Monica, CAlifornia for the term commencing on the 15th day of June, 1957, and ending on the 14th day of June, 1958, for the total rent or sum of Two Thousand and Four Hundred ($2,400) and no/100 Dollars, payable monthly in advance on the 15th day of each and every calendar month, in equal monthly payments of Two Hundred and no/100 ($200.00) Dollars, excepting only that the payment sum of $400.00 ($200.00 of which to be paid May 17, 1957) shall be made by the Lessee to the Lessor prior to delivery of the premises to the Lessee by the Lessor, and not later than June 15, 1957; said sum being in payment of the first month's rent due hereunder; and if Lessee shall not be in default in payment of any sums due hereunder and shall not be in default under any of the terms or conditions hereunder on the 15th day of May, 1958, said sum shall also be payment in full for the last month's rental due hereunder. IN WITNESS WHEREOF, the said parties have hereinbelow set their hands and seals, the day and year first above written. Eda and I are renting our house and are going to move into an apartment in Santa Monica facing the Ocean. Thanks for your kind letter 3rd.inst. Funny thing, I was thinking about you & intended to drop you a line, to tell you of a pleasant surprise I had last month - Wee Georgie Wood dropped in to see me, I imagine you know him well & have seen him many times in Pantomime & Variety around the Tyneside - he was born in Jarrow. He was over here on a business trip, he writes columns & articles for the London "Record Mirror" every week, its a very good paper with a lot of Theatrical news - very interesting. Anyway, needless to tell you we had a grand time together reminiscing, we have been friends for many years, in fact we met & worked together in Levy & Cardwell's juvenile Panto. Co. in 1907 exactly 50 years ago, all the kids were from the Tyneside, you might remember the shows as they were very well known for many years. May Gibson was in the show, she afterwards married the late George Black who controlled the London Palladium & Moss Empires etc. However, Georgie came to see my several times & I certainly was happy to see him. I have just got a letter from him, he's now back in London, he sailed back on the "Queen Elizabeth." Please convey my heartiest congratulations to Miss Page & our sincere wishes for lots of happiness. It must have been a beautiful affair & quite a sight with all those guests, am sure you enjoyed being there. Eda & I are renting our house & are going to move into an apartment in Santa Monica facing the Ocean. This place is too big for just the two of us & it's a lot of work for her to take care of, especially now that I am not able to help her as much as I used to. It's going to be a big job moving & putting everything into Storage, so will be glad when it's over with & we get settled again. I will let you know later our new address, but in the meantime if you do want to write, you can send it to this place & it will be forwarded on & I will get it OK.
Well Dear, think that's all for now, except, Mr. Hardy is still the same - eight months now & no improvement, poor fellow, it's very discouraging - really tragic. Eda joins in love & fond thoughts to you & all & trust all's well & happy. Wee Georgie Wood (1894-1979) was a British actor and comedian who appeared in films, plays and music hall reviews. Wood, who was a midget, worked most his professional life in the guise of a child, appearing in comic and sentimental sketches. He also wrote a column in “The Stage” newspaper. Wood, 4 ft. 9 in. tall, started his long career at the age of five and continued performing for over 50 years. He was considered to have been one of the most successful pantomime stars of his era. Many thanks for your very kind letter of the 6th.inst. Your thoughtful & gracious expressions are deeply appreciated. Pleased to note the picture arrived safely & has given you so much pleasure. It was certainly interesting to know the old Theatre Royal was still in operation - must be going on 60 years old now, I imagine it looks pretty ancient by now. I remember the old theatre that was on the same site which my Dad was running, it was a very run down affair - benches instead of chairs, sawdust on the floors, cement stairs to the gallery, gas was the only lighting it had, it used to play old time melodramas & was nick-named "The Blood Tub". Anyway, it used to do a wonderful business & the place was always packed. My Dad felt very greatful to the people of Elyta for their generous support & thought it would be a nice gesture to show his appreciation by building a nice new modern theatre for their pleasure & entertainment, he thought they deserved it in return for their wonderful patronage in the past. Well, he invested a great deal of money & the New Theatre Royal was erected, the most modern theatre of its time - electric lighting, the floors were carpeted, tip up red velvet chairs etc. Lifts instead of stairs to the Balcony & Gallery, even had a nursery with nurses in attendance to take care of the children so the parents & others in the audience would'nt be disturbed during the performance. The orchestra were in evening dress, the Stage crew in white uniforms, also the program & chocolate boys dressed as page boys with white gloves - not a thing was spared. Believe it or not it turned out a fiasco, the place was to elegant & the people would'nt come in, they liked the sawdust & wooden benches much better, they felt out of place in the beautiful surroundings, I imagine the feeling was they would have to be dressed up instead of coming in their weekday clothes, so the only time they did come was Saturday night, wearing their Sunday suit!. It broke my Dad financially so he gave it up along with his other Theatre - was'nt that awful? Yes, I have a memory of Blyth I shall never forget. That was odd that you did'nt have to change in marriage name & too that you were born right next door to where you now live, thats certainly a coincidence. Well, think thats all for now, hope I did'nt bore you with the story of the Blyth incident, but I thought it would be interesting to you. My kind regards to Mr Short & yourself, trust alls well & happy. Bye now, good luck & God Bless. The situation is George [Draper], if this club is being run on a commercial profit basis, we cannot permit you to use our names in such a venture as we do'nt wish to get involved in something we know nothing about. Please let me hear further from you & let me know fully & exactly regarding your operation of this club, so I can have a proper understanding. The film arrived safely, was certainly surprised when it came so soon, it only seemed like a few days since mailing it to you. Anyway, pleased to know it afforded you some amusement & interest. Again thanks for your kindness in giving me the breakdown on the De Soto "Firesweep" I imagine the freight charges would with Federal Tax & license bring it up to around $3,500. It sounds like a good deal, Buck, & will let you know further on it as soon as we get things straightened out here. As I told you in my last, we are moving into an Apt. & are in the throes of putting all our furniture & belongings into storage so our tenants can move in here June 15th. We decided to take a furnished apt. as everything we have is too big for a small place - you can imagine what a mad-house this is, will sure be glad when its over with. AFter which I will sell my car for probably enough to pay the tax & freight on the De Soto which will be a great help to me. Thanks too for the N A D A Used Car Book, very interesting to see the price on a '51 Mercury (Coupe) a Chevrolet Dealer offered me $800. on a deal & the Ford outfit $1.000.? wonder why?! All for now Buck. Ill let you know the new address later. In the meantime if you should have occasion to write, you can contact me - c/o Ben W. Shipman, 511,Pacific Mutual Bldg. Los ANgeles. 14.Calif. Mrs. L. joins in kindest regards & best wishes. The DeSoto Firesweep was an automobile produced by the Chrysler Corporation and sold through its DeSoto brand of automobiles from 1957 through 1959. The base price of the Firesweep (1957) was US$3,169 and it was offered in one and two-tone exterior finishes. Features included power steering, power brakes, dashboard clock, push-button radio and whitewall tires. I worked in a magic and illusion act a few years ago with a Bob Martini. We were known as Martini and Maxmillian. I was doing the comedy. After he had done his trick and gotten big applause, I would by accident expose them. Appreciated very much your nice card, 17th. inst. It was certainly kind & thoughtful - many many thanks. Sorry to say, 'Babe' (Hardy) is still confined to bed & does'nt seem to be making much improvement - poor fellow, its pitiful, I wish there vas something I could possibly do to help him. I guess all we can do is hope & pray - if only he could get his speech back, am sure it would give him an Incentive & help him a great deal to try & get well again, this affliction must be very very distressing to him & kind of knocks his spirit. I remember the Great A1exander very well, but do'nt recall your friend Terry Brady (Prince Samara). Note you have a little Grand-Daughter - congratulations, am sure she will bring you lots of pleasure in watching her grow up. I have two Grandchildren, a Boy & Girl, I enjoy being with them very much. Glad to know you have been working at the Hotel Connor in Joplin, thats wonderful, it must give you a lot of satisfaction & happiness in your appearances & make you feel good. Wish you many more dates & continued success, thats good for you & keeps you young! Not sure if I told you or not, I worked in a magic & illusion act a few years ago with a Bob Martini, we were known as Martini & Maxmillian, I was doing the comedy, after he had done his trick & gotten big applause, I would by accident expose them - we played Keith-Orpheum, around the East & later came West on the Pantages time - those were the happy days! Well, all for now Charlie, it was nice to hear from you again & once more, thanks for your kind thoughts & wishes. Prince Samara (Terry Brady) was a mentalist who first set foot on stage at age 11 in a vaudeville act where he drove a team of horses while blindfolded. 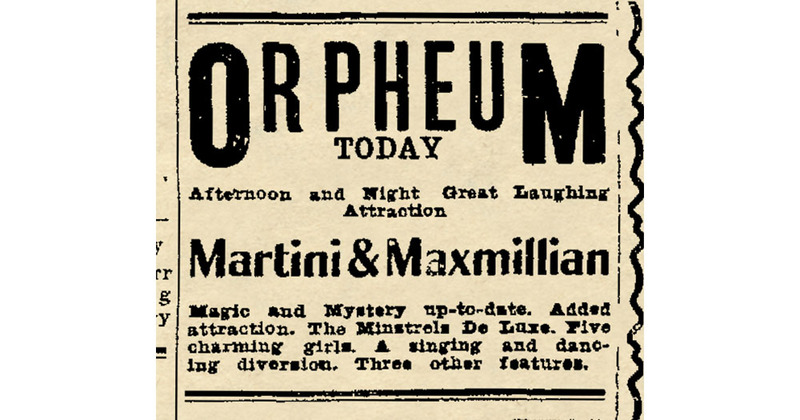 Martini and Maxmillian, burlesque necromancers, who are headliners at the Orpheum the opening half of the week, have one of the cleverest acts that has closed a bill there in many weeks. In a special setting that gives a hint of real magic and real illusions, one face after the other is exposed by the comedy team. Usually such acts are somewhat annoying but Martini and Maxmillian have put together some clever stuff. The act winds up with the dropping of about 1,000 newspapers from the files, completely burying the comedy member of the team. Glad you recd. the picture Ok.
Have just written to a friend of mine in Tampa Florida & have asked him to drop you a card with the address of a firm in New York who handle & sell all old movie stills - if you write them, they will send you a catalogue of their stock - they [have] quite a lot of L&H, so you can order what you want. I did have the address but I mislaid it somewhere. Anyway, you should be hearing from my friend soon. Bye now, all the best.